Termites, usually shy and retiring, sometimes make themselves spectacularly visible at this time of year (September-November). They suddenly manifest themselves with impressive mudtubes right out of the wall, damaging your gyprock and eating its cardboard lining. Aside from the thin papery sheets on either side of the plaster, what possible benefit could this have? The first signs of interior damage on a Gyprock wall. Two species in particular, Heterotermes and Microceretermes, are regularly responsible (it could be any type, these two are often culprits). They are slow eaters as it is, why waste time with non-edible material? Even with the nastier types like Coptotermes, wouldn’t they stick to timber? It may not be food related at all. Its springtime, and love is in the air! All species of termites do a colonising flight, most local species do it on a humid spring or early summer night. Much like the coral blooms on the barrier reef, the local termites have an uncanny sense of timing with many (if not all) local species sometimes flying on the same night. When conditions are perfect (i.e. high humidity, little or no breeze) the future kings and queens take to the skies; a high risk endeavour to fund future colonies. The problem for the termites is that they are incredibly weak flyers. Even a slight prevailing breeze can make a huge difference and the flights are never far, perhaps a few hundred metres under ideal conditions. Every little bit of extra height that they can gain might make the difference between the alates landing on the home patch or making it to fresh territory. Ordinarily this would involve hollowing out galleries in a tree and making ‘flight cuts’ through the outer sapwood and bark. The tree will naturally heal over the cut made by its parasitic invaders. Instead these termites have found your house (a very oddly shaped tree). They have no nutritional interest in your gyprock but will damage it anyway to construct mud tubes for the colonising flight. Normally alates aren’t much to worry about (they can’t fly in and get started on your house; they need moist environs, a soil like substrate and a suitable host tree. In fact their survival rate is very low. But to have a colonising flight happen inside your house is a very bad sign indeed. The termites are announcing that they are firmly in control. Some species that damage gyprock in this way are more of a threat than others but all are capable of causing expensive repairs in the form of re-plastering and repainting at the very least. 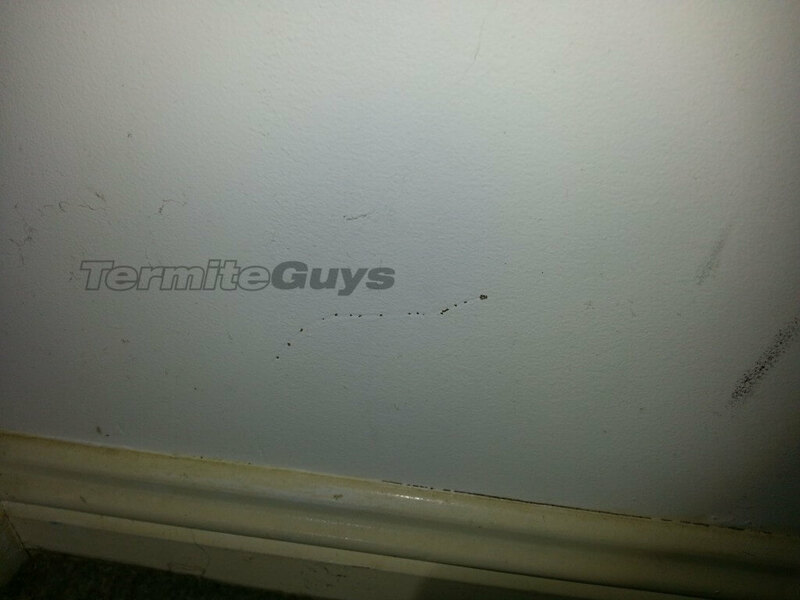 Contact the Termite Guys if you suspect this is happening to you!